My first adult sewing project. A very basic little patchwork cushion from bits of fabric I love. 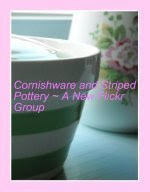 There is a wonderful tutorial for beginners at this Flickr site. Thanks, Amanda. And the "Irish Hiking Scarf". This was suppose to be completed for last Wednesday. 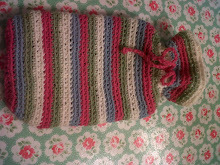 It is a gift for my eldest daughter's boyfriend, but in typical Knitty, Vintage and Rosy fashion, it was late. I have been struck down by another sinus infection and it has slowed me down considerably. Breathing has been enough of challenge. Not to mention a burnt nose. Do you really want to know? Well the doctor gave me a "Sinus Irrigation Kit" (that is as much as you want to know, trust me) and you must use previously boiled water for it. Well, there wasn't any in the kettle so I boiled some. Patience is not one of my virtues. I thought it had cooled down enough, you can figure the rest out, I am quite sure. And I am to leave in two days for a hockey tournament in the nation's capital. 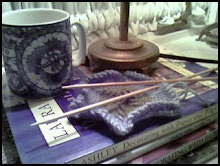 I need clear sinuses, a good book and a new knitting/crochet project. I'm not really asking for too much am I? Imagine my excitement, opening the newest Country Living with all the blue transferware on the cover. 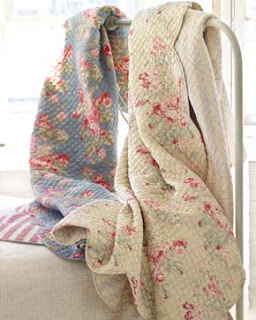 Sitting with a cup of tea, whiling away the afternoon in comfy bliss. 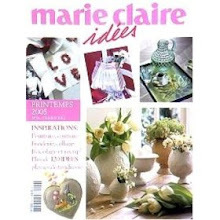 On the cover there is a little spoiler, "Classic Whites and Products We Love". Well, that gets my juices flowing, maybe some pictures of some Nordic hideaway? I am quickly falling in love with the Scandinavian Esthetic and my heart is beating just a teensy bit faster as I flip through the pages. Finally, "Swedish Style" it says. 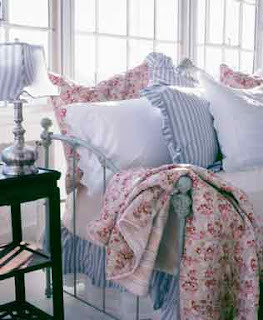 Gustavian twin beds? Geez, they look vaguely familiar somehow. Where is that magazine I was breezing through a few weeks ago? Yes, there it is. Was it in here? Bob's your uncle! Not only did Country Living re-use these beds, which in itself is really fine, because that is what decorating is all about. Finding new uses, re-purposing, re-arranging, no problem. But damn, if that isn't the EXACT same picture as what they used, oh say, back in April 2000. The exact same picture. I paid for this magazine to give me new ideas, new concepts, new. Not the exact same layout as what you gave me almost 8 years ago. So screw Country Living (although the transferware was beautiful and there is this great article about Debbie Dusenberry that is really great, but I digress) there's other fish in the sea. Like this great book I just got out of the library called...damn, didn't see that. Well, that Country Living is just everywhere aren't they? So the book is "Country Living" Collection Style. It behooves me to say, with feathers in my teeth, that it is a great book. Can you see that glorious sun filled room? Simple yet cosy. And I received the "Shortcuts to Decorating Country Style" for Christmas. Lovely, lovely pictures, and you can pretty well guess what magazine editors this is from right? I also borrowed the new "Perfect English" by Ros Byam Shaw and again, very pleased. And of course, the old standby, "The Laura Ashley book of Home Decorating". My first decorating book purchase after I was married, way back in the day. Well, now that I have made an utter fool of myself I simply must tell you that I have been working on some crafty (did I just say "crafty"?) little projects that I will be showing you shortly. I don't know if that is a teaser or better yet, a warning. I have been sewing! Btw, I actually had a pretty crummy day today, with many unexpected twists and turns and since I have been posting these gorgeous pictures and chatting with you, I actually feel better! Thank you. This magazine has had me in a spin for about a month now. I've been wanting it but unable to find it in many of our large bookstores and newsagents. While downtown yesterday, I found it at the World's Biggest Bookstore. I did try and subscribe to it online but it is in French. My French is elementary level and I am sure there is a subscription for this magazine going to some unsuspecting granny in Poland right now. I was clicking buttons all over the place. I know amazon.com sells this subscription but many of the reviewers had problems with amazon so I didn't really want to order it through them. But, now I have it and am very pleased. Beautiful colours, interesting projects and innovative designs you just do not see here in North America. Worth the wait. 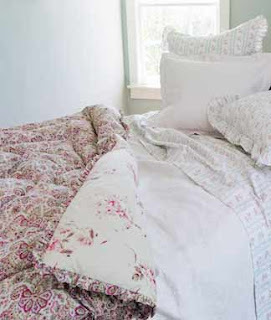 While looking for sheets online yesterday, I came across two of my most favourite bedding shops. Pine Cone Hill is absolutely divine. They have the most darling prints and cosy fabrics. 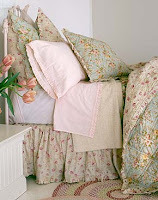 I particularly love this green and fuschia pink duvet. Just smashing, don't you think? I am also partial to Garnet Hill. 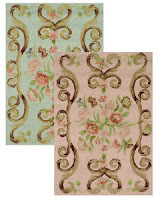 They also sell clothes, children's items and other household goodies but today, it is the rugs that I love. The turquoise and pink ones are to die for. Aren't we all in the mood for linen shopping now. Go, treat yourself. I just may. Can someone tell me why some of the blogs I have been visiting for quite some time are now prohibited? Why? I mean I can understand if it is a family blog or a blog that deals with sensitive issues but craft and decorating blogs? Too bad, some I will miss but it does give me an opportunity to list some new ones. Yesterday, I decided to take a bit of me time and go shopping. There is a lovely little "village" not far from where I live that has wonderful shops, bakeries and delicatessens. I love shopping there especially if the weather is not inclement. While browsing a funny little floral shop, I found this charming hand painted wooden tray. It looks perfect with the needlepoint cushions on the sofa (which I didn't photograph, seriously, who am I kidding, will I ever get this photography thing or what?) Pretend the deep pink tulips there have already bloomed. Cute or what? So mother came for tea today. As I greet her at the door, I notice a package sticking out of the post box. Jeez, doesn't that adorable little bird look familiar? Why yes, I do know that bird, it is a parcel from Claire Louise Milne, illustrator extraordinaire. Claire won a little giveaway I had a few months back and doesn't she mail me something. How sweet is that. Certainly unnecessary but completely appreciated. In case you cannot see (and aren't nosy enough like me and click on the picture to get a better view of blog pics), there is the most darling ribbon, delightful buttons, fabric in pinks and greens (how well does this woman know me?) and a thoroughly enjoyable copy of Canadian Home and Country which, by the way, is full of pinks and greens. Thank you so very much, Claire. As a result there is nothing but dead looking grass and mud all around the garden. What a dreary time of year. Of course, all this brown has me thinking of the spring. 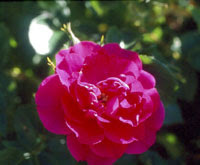 I want a new rose this year, called Earth Song. It is the lovely pink one shown on the left? (it is on the left now, but after playful blogger posts this it may end up at the bottom). I have a thing about pink roses. My first attempts were with some gorgeous french ones. Celeste and Comte de Chambord both of which did not appreciate harsh Canadian winters. Not to mention they were not recurring and I only want those now as the blooming season is so short. 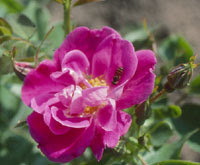 They were also very prone to aphids which are a constant nuisance here because of the hot, humid summers. 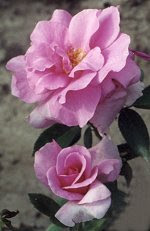 So lately I have chosen roses that are a bit more hardy, more than one bloom, but still pink and rosy. I don't really care for the hybrids, I tend to lean towards the more old fashioned looking varieties. The William Baffin and John Cabot are both from the Explorer Series and have done very well in my garden. They were developed here in Canada so they are very happy here. The tiny pale pink rose is The Fairy. What a trooper. It blooms here til November and is extremely hardy. I don't know if you are aware of our temperature fluctuations here but it can be down to -25 C in the winter and up to +40 C with humidity in the summer. 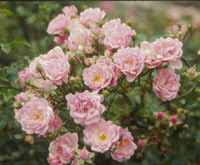 A wonderful resource for these and many roses is Pickering Nurseries. They have an extensive selection and an online catalogue. But for the truly dedicated you must visit Hortico. They are also available online and really are a super supplier of all things floral. My mother is a fan of Glen Echo, and has used their landscaping services and has been quite happy with them. I haven't been there but perhaps I can take a jaunt up there one day and meet my bloggy friend, Elizabeth. She has just moved to a new rural home and I am sure gardening will be on her to do list come spring time. 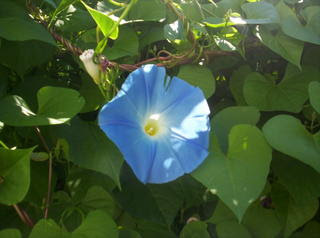 Oh, and the blue morning glory? That was from my garden a year or two ago and thought it might just put a smile on your face. Well, that is the plan anyhow. I have been doing nothing but enjoying these wonderful days with my family. My husband and I have spent our holidays with pots of tea, morning coffees and salubrious lie-ins snuggled in our king size bed, with snow flakes gently falling outside our bedroom windows. We have been blessed with more snow this year than usual and have been savouring every minute of it. As you can see, I finally purchased the new camera. I managed to find an online deal here, although they were out of stock, I was able to print off the advert and got the local electronics store to price match it. Glorious. Now I just need to figure out how to actually use it without always choosing the "auto" feature. It is the Canon A560 so all suggestions will be welcome. I must have been a very good girl this year as I received some truly thoughtful gifts from both family and friends. My husband got me a sewing machine, yes you read that correctly, and I am ready now to embark on the journey to the sewing world. I also received many books, dvds, cds and of course, the obligatory pajamas. One movie, in particular was a complete delight as I have searched for it on many occasions all to no avail. If you have never seen My Life So Far, you are really missing out. And who doesn't love Colin Firth and Rosemary Harris? My daughters gave me the most beautiful porcelain blue and white chopsticks. 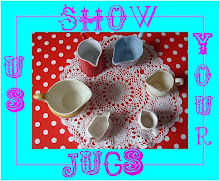 They are just lovely displayed in an ironstone jug. Why didn't I show you those? What a grand photographer! I am still waiting for my carpenter to come and do something with my kitchen cupboards. I want them painted with new knobs and some repairs done to some of the drawers as they have not been cooperating lately. All my other repairs have been accomplished but the front door closes most reluctantly now since they "repaired" it. Two steps forward, three steps back. Well that's most of my news. 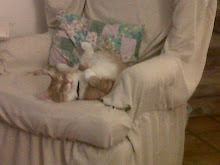 I was quite sick at the beginning of the holidays with a very nasty sinus thing. This seems to be making the rounds both here and in the UK and I can only hope all the ill bloggers get better quick. I miss all your lovely posts!